Stitched Together: Off my needles and onto my feet. Off my needles and onto my feet. I am so happy right now, that I've decided not to wait until Friday to tell you about my FO, but brag about my endeavours today. Today I got my second Discovery Sock finished. I have a fully fitted and finished pair of socks gracing my feet right this minute. They are so comfortable and they don't dig into my calves the way socks normally do. I LOVE these socks so much. I love how they cup my foot and don't nip me at the cuff. I know that I am going to have a pair of socks on the go, until my sock yarn runs out. Now I have finally found the perfect sock for my weird foot/ankle/calf combo I need to knit more, until I have a drawer full of them. Now I have reached the end of this particular pair of socks, I have decided to try another pattern from the book. I'm not sure which pattern I will choose yet, but I have decided to use a couple of very old sock skeins. I bought these skeins back in September 2008, so it must have been one of my first sock yarn purchases. I decided to use my oldest sock yarn and try and work forwards. I have been buying far too much yarn recently, and instead of buying a new stash box, I'm going to try and use up some of the stash I have already got. It shouldn't be too much of hardship. Most of the yarn I've bought in the last year and half is pretty yummy stuff. 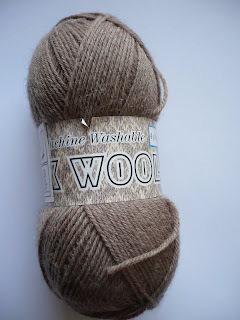 The older yarn is not as nice, because I didn't know much about the yarn market then, however only a bit of it is downright nasty. I really ought to dig out the rubbish stuff and get rid of it, as I know I'm never going to knit with it, but my hoarding gene won't let me - I might need it one day! Until I can fit more yarn in my stash boxes, I'm only going to buy yarn for projects that I am immediately going to start. That way I won't have to find a space to store it. It's about time I started demolishing my queue and my stash.